A look through the catalogue of compositions by Jesús Torres offers the immediate possibility of an insight into his work. Alongside the compositions which bear the names of forms and genres - like ‘Trio’ here, the Oboe Quartet of 2009 or the Variations for Cello and Piano from 2004 - there are many works with poetic titles. I do not use that adjective loosely, given Torres’ well-documented interest in poetry. Amongst such titles, images of light and water abound, in works like ‘Aurora’ (2002) and ‘Wasserfall’ (2005), both for solo piano; chamber music such as ‘Crepuscular’ (2000), ‘Splendens’ (2002) and ‘El misterio del agua’ (2007); and songs like the ‘Dos canciones del mar’ (2007, setting texts by Rubén Darío) and ‘Noche oscura’ (2006, a setting of a famous poem by St. John of the Cross). On the present disc it is light which is the more prominent, but for Torres the two (light and water) are inextricably interconnected - as in ‘Manantial de luz’ (which might be translated as ‘the spring - or source - of light’), the third section of which carries the direction ‘Torrencial, inundado de luz’. Light, water, music - all have their wave-forms; In ‘El cántaro roto’ (The Broken Waterjar) Octavio Paz writes of a moment when ‘la luz canta con un rumor de agua’ (‘the light is singing with a sound of water’). In Torres’ music one has, time and again, a sense of the rising and falling/setting of water/light, of the figurative interconnections between sound, light and water. ‘Manantial de luz’ is scored for solo piano, flute, clarinet, violin, viola, cello and percussion though its closing passage holds a surprise for the listener in this regard. The writing alternates isolated sounds of great purity and altogether ‘dirtier’ sequences. The result is hypnotic, especially in the opening section (marked ‘Onirico’) and the sixth and last section (‘Intensamente dramático’). It is here that the composer springs an instrumental surprise, which is evidently - according to the booklet essay by Álvaro Guibert - also a visual, theatrical surprise: ‘For this CD’s listeners it may be of interest to know that the performance of this work requires … a semicircle of gongs and tam-tams, which are only heard at the end when the six instrumentalists rise in an orderly fashion, each going to his or her gong. The typical characteristics of the individual instruments recede into the background and are replaced by a single, all-encompassing sound. As soon as the music begins to fade away, the musicians likewise retreat into themselves and bow their heads’. That sense of the theatrical, even quasi-liturgical (the first piece in ‘Prsencias’ is called ‘Liturgia’) is inherent in some of the ways Torres’ music works, with its constant cross-referencing of other artistic media and forms. Thus ‘Poética’ takes the form of five pieces, each ‘after’ a German poem - a number of them soaked in the imagery of light or its absence - these being poems by Novalis, Hölderlin, Rilke, Trakl and Celan. These are not settings - there is no vocalist, the work is scored for clarinet and piano trio. Nor are they merely programme music ‘illustrating’ their source poems; one might think of them as translations, or rather imitations, in another ‘language’, that of music. The texts are not provided, though the booklet notes identify the relevant poems and it is worth taking the trouble to find them as knowledge of them certainly enhances appreciation of Torres’ work. The musical language is, broadly speaking, in line of descent from Messiaen, though far from being merely derivative. 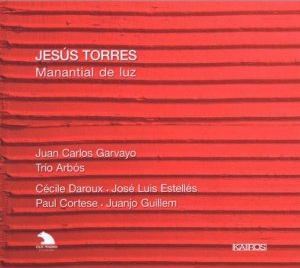 Torres produces some ravishing and fascinating instrumental juxtapositions and dialogues, the writing for clarinet being particularly inventive and the playing of José Luis Estellés very impressive. When we reach, at the end of the sequence, in the darkness of Celan’s ‘Todesfuge’ (Death Fugue) with its reiterated image of the ‘Schwarze Milch der Frühe’ (‘Black milk of daybreak’ as Michael Hamburger translates it), the effect is profound, harrowing and beautiful. The four pieces for solo piano which make up ‘Presencias’ I find rather less absorbing than either ‘Manantial de luz’ or ‘Poética’. Without the range of colours available to him in the group pieces, Torres’ ideas are not so consistently interesting and the pieces feel somewhat less substantial as well as being rather less fully individual, although ‘Yakarta’ written for the pianist Ananda Sukarlan, the Indonesian-born pianist who has a well-deserved reputation as an interpreter of Spanish music, is quite striking. ‘Trio’, written for and played by the excellent Trío Arbós, is a fine work, growing from some relatively brief phrases, exchanged between the instruments, though the piano is initially dominant, through an intricate middle section in which instrumental interplay and rhythmic patterns set up a changing texture full both of insistent energy and the occasional surprise. This then gradually falls away to a relatively unimpassioned, retrospective conclusion which remembers some of the phrases and gestures from the work’s beginning. The subtlety of ‘Trio’ becomes more apparent with repeated hearings. ‘Decem’ was apparently written for Trío Arbós as an encore piece, and is fittingly lively and engaging, not least in its fierce rhythms. All in all, this is a thoroughly rewarding album of contemporary chamber music for all with even mildly adventurous tastes.